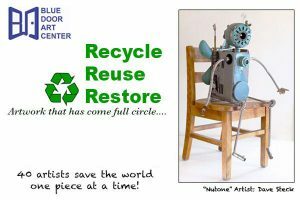 See works of art from 40 artists that use recycled, reused or restored elements. Our planet is at a critical moment in time and this artwork is more relevant than ever. Bring home a new treasure. This entry was posted in Press Releases and tagged are sale, Art Exhibition, Blue Door Art Center, recycled art, Yonkers. Bookmark the permalink.